By Peter Anderson 1 Comment - The content of this website often contains affiliate links and I may be compensated if you buy through those links (at no cost to you!). Learn more about how we make money. Last edited August 28, 2013 . If you're been reading this blog for a couple of years you may remember when I started writing about one of my favorite banks, Perkstreet Financial. When I first learned about Perkstreet I was intrigued because their Mastercard had a cash back rewards component to the account, much like the cash back cards from a variety of credit card companies that give you 1-2% cash back. The twist was that Perkstreet wasn't a credit card, it was a debit card attached to a checking account. While they weren't the only bank with a cash back component to their checking account, it was certainly one of the better ones in my opinion. When Perkstreet launched they had a generous 2% cash back for all spending on the card for 3 months, and then after that you'd get 2% cash back if you maintained at least a $5,000 balance. I enjoyed that 2% cash back on our spending until in early 2012 Perkstreet announced that they were changing their cash back program. They basically dropped the 2% cash back for those with over a $5,000 balance, and replaced it with a 2% cash back at only certain online stores. It essentially cut in half the amount of perks I could earn in a year, overnight. When they made the change to the cash back structure there were some rumblings that they were doing it in order to attempt to remain profitable, and without the changes that wouldn't be possible. Well apparently it wasn't enough. A week or so ago I logged into my Perkstreet account online, only to find this message in front of me. Rewards Debit Cards In Trouble? Earlier this year Perkstreet sought out additional funding in order to keep the doors open, but weren't successful. As such, they decided to cease operations. We have some bad news to share. 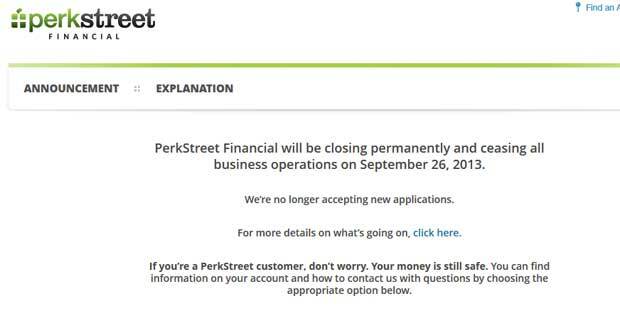 PerkStreet Financial will be closing permanently and ceasing all business operations as of September 26, 2013. Even after PerkStreet Financial closes, your account will remain open, and you can continue to access your money in the same ways you do today, including your debit card, checks, and online bill pay. Online banking at http://myperkstreet.com will continue to be available. Consistent with the terms of our Rewards Program Agreement, we have discontinued our perks program and cancelled all perks balances as of today, August 12, 2013. Redemptions requested prior to August 12, 2013 will processed in accordance with your request. We would like to make your transition as easy as possible. There are additional resources for you below in our FAQs. Also, please do not hesitate to call customer service at 866-792-2834 or email support@myperkstreet.com with questions. You helped us forge a path toward new ways of receiving benefits through financial products. We hope that legacy continues even though PerkStreet will not. Thank you for believing in us. If you had un-redeemed rewards as of August 12th, they're no longer able to be redeemed. The terms of the Perkstreet rewards program say that they can cancel at any time apparently, and the perks can be cancelled – which they have done. They just ran out of money and weren't able to pay the rewards. O’Malley, who has been responding personally to angry Twitter and Facebook posts from customers, said PerkStreet had paid out more than $4 million in rewards before running out of money. It is disappointing for me since I had about $20 in perks sitting in the account about to be redeemed, and I had no advance warning that this was happening. Now I'll never be seeing that money. At least I didn't have a large amount of rewards saved up but un-redeemed like some people. Since Perkstreet Financial is shutting down operations, what are your options for closing your account? Perkstreet gives the following instructions. Before closing your account, you need to ensure that any pending transactions–including direct deposits, scheduled payments made through bill pay, recurring automated transfers, or transactions that have not yet posted–have been completed or cancelled. You should also make note of any recurring transactions so that you can set them up with your new account. After confirming that all transactions have completed, you can simply spend down your account balance using your PerkStreet card or transfer your balance to an external account. The account will automatically close if the balance remains at zero. You can also call customer service and request a check for your remaining account balance be mailed to you. The standard processing and mailing time will apply. Online – To make the process easier for you, you can now close your account online. You will need to login to your account. Next click the My Accounts-tab. Next select the Options tab. Follow the link to close your account. This will submit your account to the bank for closure. The standard processing and check mailing time will apply. So basically to close your account you just need to cancel any scheduled deposits/transfers/etc so that they're no longer tied to this account, and then spend the account down to zero and/or transfer the balance to a linked account. Once your account gets down to a zero balance and stays there the account will automatically close. If you prefer you can just go into your account and there is now an “account closure request” menu option as well. That will submit your account for closure, and any remaining balance will be mailed to you. With the closure of Perkstreet Financial, the question is now, in my mind, is having a cash back checking account a viable business model for other banks out there? In Perkstreet's case it doesn't appear that it was, in part because their revenue came mainly from credit card swipe fees. They didn't have a lot of other revenue centers like some big banks do, and as a result the business model of getting revenue mainly from swipe fees just wasn't sustainable. That was even more-so the case after Dodd-Frank was passed since it capped the credit card swipe fees banks can charge merchants. The Dodd-Frank law, adopted by Congress after the recent financial crisis, capped the so-called swipe fees at 21 cents for each transaction, compared to 44 cents previously. The savings for retailers was supposed to lower costs for customers. The new law cut into bank revenues, and many financial institutions have eliminated rewards programs and tried to raise fees elsewhere, said Greg McBride, a senior analyst with Bankrate.com, a consumer-oriented financial site. So a side effect of the government regulation is that for many banks the cash back rewards programs are no longer a financially viable product, especially if the swipe fees are a main source of revenue and they don't have other areas that they can raise fees. So the question now that Perkstreet is closed, is what checking account alternatives are there out there, and are there any other good cash back checking accounts? Right now I don't have an answer, but I'll be doing some research. My guess is that there aren't a lot of them as other companies have found that they're not typically very profitable for them, and other have already closed down their debit rewards options. For now we may be looking into getting a checking account with Capital One 360 as we already have a couple of savings accounts there, and have been happy with their service. Otherwise, if you're looking for a new account right now we do have a list of options listed on our bank rates page. Did you have a Perkstreet account? Were you surprised by the news? Do you know of any good cash back alternatives currently in the market? Signing Up For PerkStreet Financial Rewards Checking Account: I'll Be Getting 2% Cash Back, Plus 5% On Selected Categories! Last Edited: 28th August 2013 The content of biblemoneymatters.com is for general information purposes only and does not constitute professional advice. Visitors to biblemoneymatters.com should not act upon the content or information without first seeking appropriate professional advice. In accordance with the latest FTC guidelines, we declare that we have a financial relationship with every company mentioned on this site. Peter, I too am bummed that PerkStreet got slapped down as a result of Dodd-Frank. The powers that be may have wanted to prevent these kind of cash back checking accounts from being sustainable, but that’s another discussion. I am interested in knowing if you do find a decent rewards debit card/checking, even if it’s not a cash back program – earning at least something on cashflow is always nice.